The United States has been on a decade-long spending binge. Thanks to the profligate policies of both Bush and Obama, the burden of federal spending has climbed to about 25 percent of economic output, up from 18.2 percent of GDP when Bill Clinton left office. The academic research, however, tells a different story. Here are some brief excerpts from a recent study by two Swedish economists, including a critically important observation about the impact of bigger government on economic performance. …most recent studies typically find a negative correlation between total government size and economic growth. …the most convincing studies are those most recently published. …In general, research has come very close to a consensus that in rich countries there is a negative correlation between total government size and growth. It appears fair to say that an increase in total government size of ten percentage points in tax revenue or expenditure as a share of GDP is on average associated with an annual lower growth rate of between one-half and one percentage point. Let’s focus on the last sentence of the excerpt and contemplate the implications. The research cited above tells us that annual growth is 0.5 percentage point-1.0 percentage point lower if the burden of government rises by 10 percentage points of GDP. Well, the burden of federal spending has jumped by more than 5 percentage points of GDP during the Bush-Obama years, indicating that annual growth in America is now 0.25 percentage point-0.5 percentage point lower than it otherwise would be. Now let’s take the best-case scenario, and assume that annual growth has only dropped by 0.25 percentage points, and consider what that means. It may not sound like much, but even small differences in growth rates become very important over time. For an average household over a 25-year period, the loss of 0.25 percentage points of growth means annual income will rise, but the total increase will be about $5,000 smaller by the 25th year. The budgetary implications of growth also are rather important. According to the Congressional Budget Office, the economy’s performance has a large impact on tax receipts (more growth means higher incomes and more taxpayers) and a small effect on government spending (more growth means fewer people at the public trough). CBO even publishes a “sensitivity table” with specific estimates (Table B-1). If we once again use the best-case scenario and assume the Bush-Obama spending binge has reduced annual growth by only 0.25 percentage points, the CBO numbers show this means more than $750 billion of additional red ink. This is something to keep in mind as the White House argues that job-killing class-warfare tax hikes will somehow improve the budget situation. Let’s now return to the academic research. 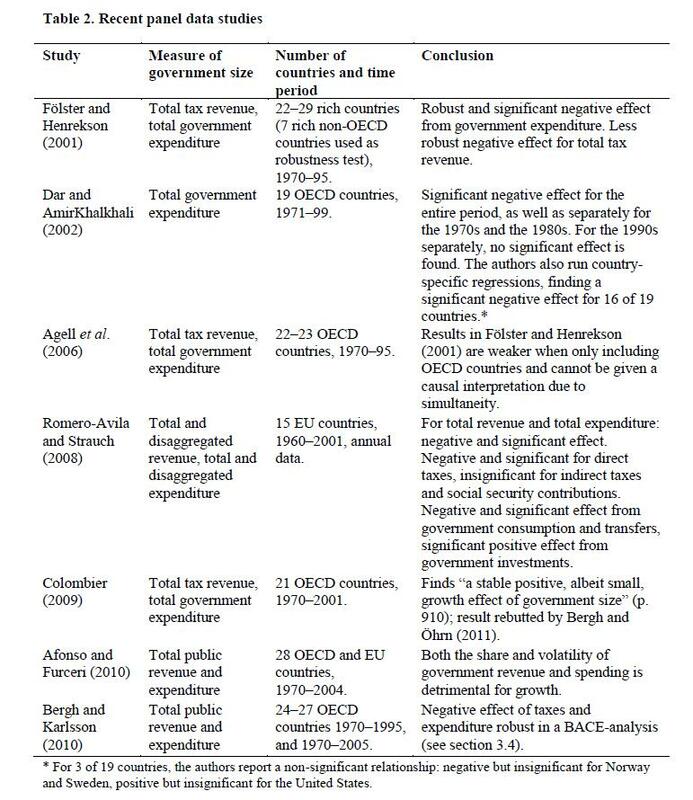 The authors included a very helpful table showing the results of recent studies on the relationship between the size of government and economic performance. Click on the image for a full-size look at how the majority of scholarly research this century confirms that big government is bad for prosperity. For all intents and purposes, all this research shows that developed nations are on the downward-sloping portion of the Rahn Curve. Named after my Cato colleague Richard Rahn and explained in the video below, the Rahn Curve is sort of a spending version of the Laffer Curve. It shows that growth is maximized by small governments that focus on core “public goods” like rule of law and protection of property rights. But when governments expand beyond a certain growth-maximizing level (the research says about 20 percent of GDP, by I explain in the video why the right number is probably much smaller), the result is slower growth and less prosperity. With the exception of high-growth Hong Kong and Singapore, all developed nation have public sectors that consume at least 30 percent of economic output. This means that government spending is undermining prosperity all around the world. And since the burden of government spending is close to 40 percent of GDP in the United States…well, you can fill in the blanks. It’s amazing how obsessive a lot of people in the USA get about their pet topics. Big government can be good, big government can be bad. It depends how well those governments are run. It is not the case that big government is necessarily bad, however much of a mantra Dan Mitchell makes it. Taxation levels in Scandinavia are massive, but so are economic figures—and, significantly, national happiness figures. In addition, there is rightly a level of government involvement in our lives that we never had in the bad days when people were left to starve, become ill, in insanitary housing, in badly policed streets, etc. Government has rightly taken on burdens of care, and we are all the beneficiaries of this. We should calm down and not be so shrill about these good things, without which all of us would be a lot worse off. And we should not hawk our beliefs round the world, like Christian missionaries. If you want to argue this out, then do so at home, in the States, but please don’t imagine you have the right to change the way other countries manage themselves. It may just be–imagine!–that we know something that America does not. This post describes the seminal issue of American voter behavior and the endgame of American prosperity. So, numerous comments could be made. The most important I can think of is whether a vicious cycle is triggered in voter behavior once lower growth sets in. “Let’s mandate that we all work together in a common plan to exit the crisis and once our sacrifice bears results, and we succeed, we can have back our personal economic and other freedoms” becomes a dominant theme. But alas, prosperity never comes and decline accelerates. Why? Because unlike what followers of HopeNChange will tell you, people just don’t work with enough purpose to benefit some distant unknowns. Or at least there is not nearly enough raw altruism in enough people to work with purpose half their day for the benefit of some distant unknowns. People work with purpose when they can benefit their families, their relatives, their friends, and whomever else they CHOOSE to benefit, not some distant, presumably needy unknowns two-three thousand miles away. If that were not the case, the American middle class (who ultimately earns more than 90% of the planet does) would give at least half its income to Africa and still remain in the top 10-20% in the world prosperity order. But this theme of retrenchment to economic collectivism is the central theme now being played throughout the Western world in response to what essentially amounts to competitive pressure from three billon people in the developing world who, having just recently earned some long missing economic freedom are growing gangbusters and are starting to effectively compete with the West. The West is responding to this pressure in a classic textbook suicide mode: By reneging and retreating from the very principles that led it to prosperity in the first place. Calls for submission to inherently limited narrow and unimaginative collective goals are the sure path to decline for the West. But returning closer to the post…. What if government size in the 20% (the American empirical socioeconomic equilibrium point) to 50% (the French socioeconomic equilibrium point – on the descending side of the Laffer Curve), range represents an inherently unstable equilibrium situation? By unstable I mean that once your system is perturbed significantly away from the 20% American equilibrium point then you slide all the way to the 50% French equilibrium point in a couple of decades and then languish in perpetual stagnation from then on? I do not know if that is the case, but the existence of the vicious cycle I just described, as I have seen it been played in Europe over and over predictably in one country after the other, surely makes a strong argument for an inherently unstable region between the 20% and 50% Government/GDP points. Ah, the old “econ is not a real science” canard. A physicist need not solve all the equations of motion for a mole of He gas to know that the ideal gas law will (approximately) apply. Likewise, an economist need not account for all the transactions of value lost when politicians mis-allocate limited resources to know that such mis-allocation will lower the performance of the economy. on July 14, 2011 at 4:43 pm Art R.
First off, economics is not really a true science like physics, even though some econometric equations look like they’re describing orbital dynamics. I’m always amused when economists try to predict things like GDP growth for the next 4 quarters. Everyone comes up with a different number and if you average out all of the predictions, it never comes close to the actual figure. So, I’m going to take the results of this Swedish meta study with a grain of salt. Ditto for the Laffer and Rahn curves and just about every other economic postulate. And a question for Daniel. What would be the case if all economic activity resulting from the extra “burden” of government, i.e. the “stimulus,” were confined to the USA instead of mostly winding up in the foreign countries where the products that we consume are manufactured?